Each bar is handmade with high quality dark chocolate and organic cream, not corner-cutting extracts. Featuring vanilla-bean shortbread and fleur de sel caramel, the Fix bar delivers every bit of the satisfaction it promises. With a sweet-and-savory riot of peanut butter, pretzels, and fleur de sel caramel, it's easy to see why the Kitchen Sink bar is a Food & Wine Editor's Pick. Dark cocoa meets crispy coconut in the Coconut Dream bar. The salted caramel provides an encore of deliciousness. Plan some serious me time with the Space bar's vanilla-bean nougat, toasted almonds, and fleur de sel caramel—a Good Food Award winner. 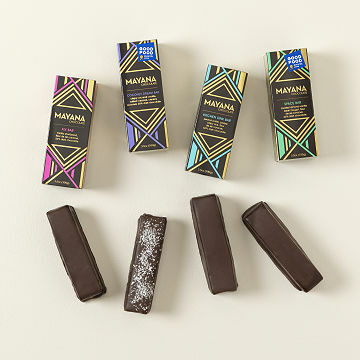 The decadent set of shareable bars is presented in beautiful Art Deco-inspired packaging that honors ancient Mayan decorative motifs. Handcrafted by Daniel and Tamara Herskovic in the aptly named Spooner, Wisconsin. Husband-and-wife team Daniel and Tamara Herskovic love chocolate almost as much as they love each other. That's not just romantic branding: they have an epic adventure to prove it. The two journeyed to Spain to walk the 350-mile Camino de Santiago pilgrimage route together, which affirmed that their love for each other could outlast 700,000 steps. And they're still going strong. Daniel takes world-class chocolate and adds culinary finesse to create the couple's edible treasures. Tamara brings her design and event planning skills to help orchestrate the experience. She fashions their packaging and custom designs, and brings her warmth to promoting the couple's creations. This was a Christmas gift for my nieces husband, but the entire family loved them. I know what to get him every year for Christmas now. He loves unique chocolate and this hit the mark deliciously.